4. Check "Load weather from personal weather station" mark. This tells YoWindow to load the current weather for the location from your weather station instead of downloading the weather from the Internet. 5. Click "Setup" button to open Weather Station Properties. 6. Enter the full path to yowindow.xml file in "URL" field. C:\heavyweather\yowindow.xml in the example above. 7. 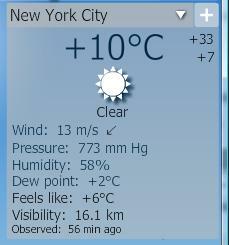 That's it, close both windows by clicking OK.
Now YoWindow displays the current weather provided by your weather station. YoWindow highlights weather parameters read from the station in deep blue color. In case some weather parameter is not provided by thet weathers station, like precipitation or sky conditions, the corresponding parameter is taken from the closest METAR station. If you wish, you may turn deep blue highlighting off. Go to Options/Advanced and uncheck "Highlight Weather Station parameters" check-mark.